Pope Francis knows it’s time to act on climate. In his second encyclical, Laudato si’, “On Care For Our Common Home,” he wrote that, "Climate change is a global problem with grave implications... It represents one of the principal challenges facing humanity in our day." Faith communities around the world agree. Roman Catholics, Episcopalians, Evangelical Christians, Presbyterians, Methodists, Muslims, Jews, Orthodox Christians, Hindus, Buddhists, and many other religious groups overwhelmingly acknowledge that climate change is real, the burning of fossil fuels is causing it, and we humans have a moral responsibility to correct it. 213 faith organizations signed the We Are Still In declaration demonstrating their support to help the U.S. achieve its promised greenhouse gas emissions reductions under the Paris Agreement in response to President Trump’s announced withdrawal in June or 2017. Businesses and investors – almost 2000 of them – stood up and signed the We Are Still In declaration as well, just another example of business climate leadership. 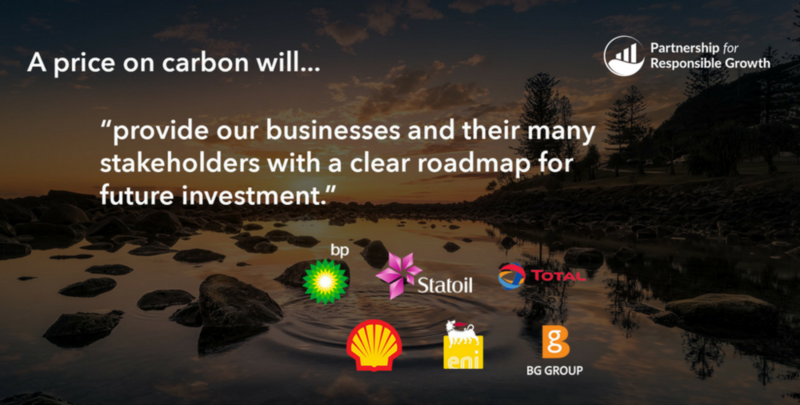 In 2015, BP, Shell, Total, Statoil, BG Group and Eni put the case this way in a letter to the UN Framework Convention on Climate Change: "Our companies are already taking a number of actions to help limit emissions ... For us to do more, we need governments across the world to provide us with clear, stable, long-term, ambitious policy frameworks. We believe that a price on carbon should be a key element of these frameworks." The Pope has convened a group of U.S. business leaders at the Vatican to discuss the climate challenge, bringing together faith and business to work towards the goal of protecting our people and our planet. Who’s missing? United States leadership. It’s time for America to step up in the climate conversation. A price on carbon emissions in the U.S. is the market-based policy solution that both faith and business communities support – 607 companies already price carbon in their internal accounting. Learn more here about the climate, revenue, and security benefits of a federal price on carbon. The Pope agrees that "There is an urgent need to develop policies so that, in the next few years, the emission of carbon dioxide and other highly polluting gases can be drastically reduced.” A price on carbon is the most effective policy to do just that. It’s time for the U.S. to take our seat at the table. Sign up below for insights on the case for federal carbon pricing.